An engine can either be economical, powerful or environmentally suitable. But it won’t run without a high-quality Delco Remy starter. Moreover, it will also require a high-quality Delco Remy alternator too. If you have your own car you will surely have the knowledge about starters and alternators. For instance, if today your automobile is running smoothly and tomorrow suddenly it stops responding, what would be the problem? Either the starter has developed some problem or it can also be the alternator troubling you. In another case, if the automobile is starting and does not have a starter problem, it can stop if the alternator has a problem. It won’t charge the batteries while the automobile is running. The automobile will shut down if you run battery dependent appliances for the longer duration if the alternator is not working properly. Starters and alternators are two different components of a car engine. Because of the starter, the engine proceeds from its stationary position to move. On the other hand, the power supplied to the engine so that the automobile keeps moving is done by the alternator. Therefore, together starters and alternators form an assembly which keeps your car in motion. They have similar functions but it is difficult to rule out what is causing the problem in the automobile when it stops functioning. If the starter in your automobile is having any problem, it will not allow the engine to start or turn on. On the contrary, bad alternators give themselves away when the engine is turned on, but the devices such as lamps, music systems, electric driven functions or power locks using power will stop working. The alternators also have the function to charge batteries. So if the batteries of your automobile stop working then it can be an indication of a poor working alternator. The alternator charges the automobile batteries by utilizing the energy of the running engine and thus converting it into electricity which recharges the battery and also supplies power to other power drove devices in the automobile. The starter utilizes the electricity from the batteries so that the gears are engaged and the engine is put in motion. You can thus distinguish between the starters and alternators by keeping a close watch when you start the engine of your automobile. Like other parts even starters and alternators also lives span. However, both of them are heavy duty components. If you figure out that there is any mechanical problem with your automobile because of the starters or alternators, then you should opt for changing either of them. You should emphasize on buying high-quality Delco Remy heavy duty spares. 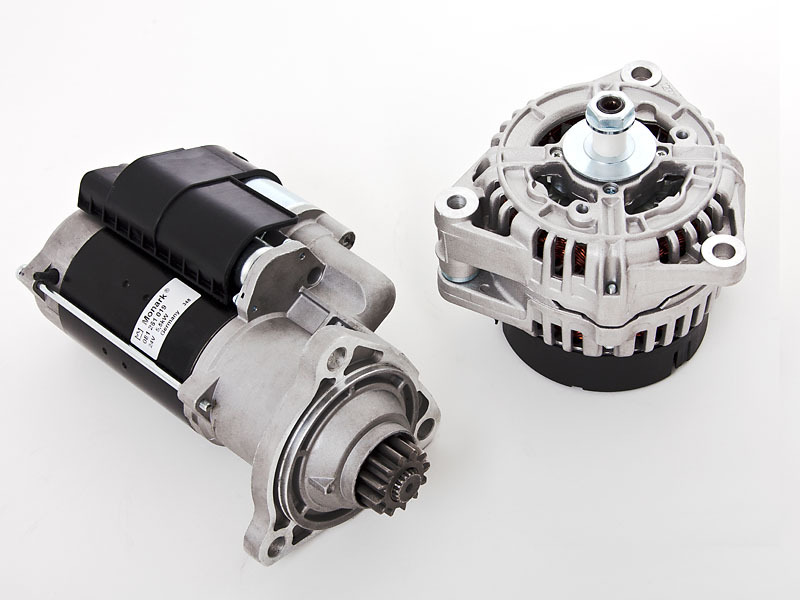 Starters and alternators like other spare parts and engine parts are different for automobiles. It depends on the utility value and the purpose it is used. Though the mechanism of an alternator works on a simple principle of utilizing the electromagnetic energy, it ought to be a heavy duty. You should purchase these heavy duty alternators from a reliable supplier that caters best to the brand of your automobile. This ensures improved performance, resulting in the longer shelf life of the parts. It is compact in size and lighter in weight. This enables ease in the service. It also reduces the overall weight of the vehicle. It has an inline gear reduced with 4 planets that give higher torque in small packages. This inline design reduces the envelope requirement. Due to this, the gearbox is 40%stronger. Proper pinion to the ring gear is ensured because of the electronic soft start. It starts with full engagement because of the rotating pinion. The Delco Remy heavy duty starters and alternators have the roller clutch drive which makes it able to stand the shock loading. It has an inbuilt OPC that safeguards the system even in harsh and adverse weather conditions. If the components of the starter or alternator are loosely connected to the engine, the vibration will damage the internal sensitive parts. But because of the latest designs, it can stand high level of vibration, endurance, and durability. The Delco Remy starters are built up with such foreign materials that prevent the formation of corrosion, dirt, and dust. This entry was posted in Delco Remy and tagged delco remy on October 20, 2017 by dtsdev.